New ways to support indie dyers? I've been talking to a couple of good indie dyer friends of mine about ways that I can support them beyond what I already do. 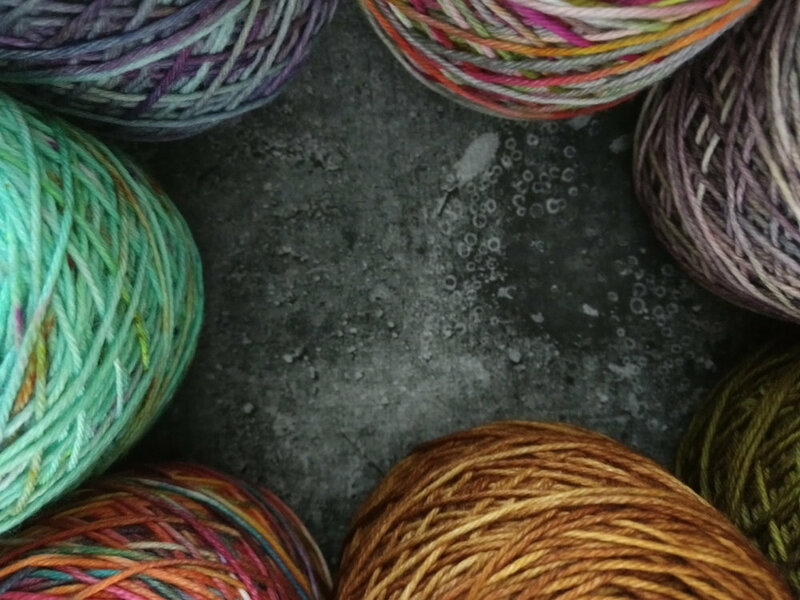 Stopping print wholesale will be less of an issue for shops but more of an issue for dyers, as they won't have access to the Ravelry In-store system. So I got thinking, and would appreciate some feedback? This is the first idea I had, and it's something I can easily do for dyers in the UK or EU. For the new collection and for Elemental, I could put together business cards that have images on one side, then yardage/gauge/size info on the back, with the URL of where to buy the collection. This would ideally be coupled with the dyer knitting a sample or two, and I'm up for sending you a gift download link if you get in touch. Maybe business cards wouldn't be big enough, maybe postcards would be better... and as I'd be printing a fair few the cost would be relatively low for me. I could then send these out to dyers in batches of 50 or so, gratis, and then you have something to give to your customers when they buy yarn based on the sample they've seen. Win win, except I'm not going to be sending envelopes of heavy paper around the world! So then I got thinking about downloadables, so you could print them yourself. However, I'm not sure whether the business/postcard sizes would suit dyers, as having them printed professionally is going to cost and that might be prohibitive, and I imagine that some/many dyers may prefer to print at home? And if so, what size do I make the downloadables? Or would having the business/postcard sizes available for free download be enough, and then you'll juggle how to print them yourselves? Do let me know what would be easiest - if I'm going to make a resource pack for dyers I want it to reach as many as possible. So print wholesale has been nipped in the bud, and yarn stores can purchase through the Ravelry In-store sales system, but that doesn't help dyers. I have worked with a few dyers, either by them ordering wholesale print from Magcloud, or by me printing an exclusive set of (printed) patterns that I then invoice for, and going forward neither of these will be an option. But how about I still prepare the digital file, you buy a license to print however many from me, then you print them yourself? The invoice would simply be for a digital license, calculated on however many copies you think you'll need to print. For some that maybe only 10, for others 50. Digital Printing in the UK is where I usually get consumables printed and their rates are pretty reasonable. They've branches in Ireland, too, although I'm not sure if they'll ship to the EU. I could also make a US Letter version of the file, as well as A4, so I could offer this out worldwide. The other option is to invoice for however many single use download codes, which you could then add to a postcard or leaflet, but most indie dyers have told me that if possible, folks like to buy the printed pattern at shows alongside the yarn? Please do give me some feedback on this! It will involve some trust but I don't have a problem with that - I have a pretty good relationship with dyers. If there's something I've not mentioned that you'd like to see in action to support indie dyers, please do let me know in the comments below! Obviously I've my own limitations to factor too but I want to try and find clever solutions that suit both of us. I really like the downloadables idea - free marketing material that you can download and print off. I could set up a separate page or include them on the collections' pages, alongside the blogger/reviewer press packs. Newer:A donation drive - help me raise money to fight the rise of Fascism? Una donazione: aiutatemi a raccogliere fondi per combattere l'ascesa del fascismoOlder:I worry about the size of the Hats I make.